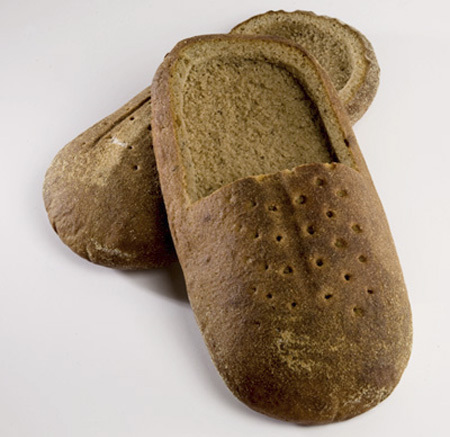 Twin brothers Remigijus and Egidijus Praspaliauskas designed a series of unique shoes made out of bread. 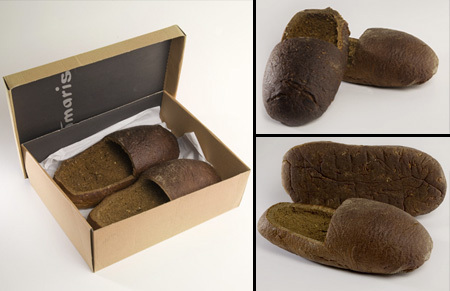 Available in a variety of designs, each pair of edible Bread Shoes costs €22 and comes in a hand picked cardboard box. Pure genius. 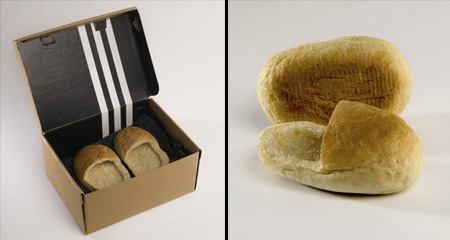 Forgot the energy or health crisis… make shoes of bread. You gotta be kidding…… what about the smell? The dirt? Iugh! 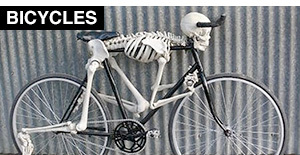 Not such a good idea i think…..
hah“so cute ,Children should love it . LOL. 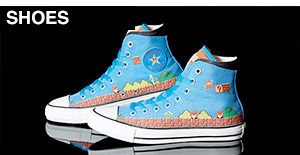 i love these :D i would totally buy them just to be ridiculous. Not to mention what would happen to them after the first couple of steps out of the house, or the first couple of steps when it was raining. LOL!!! WFT!! Very creative mmmh now i’m hungry. don’t like them. other people would be glad having some bread, but what are they doing instead? they’re making shoes. wtf? 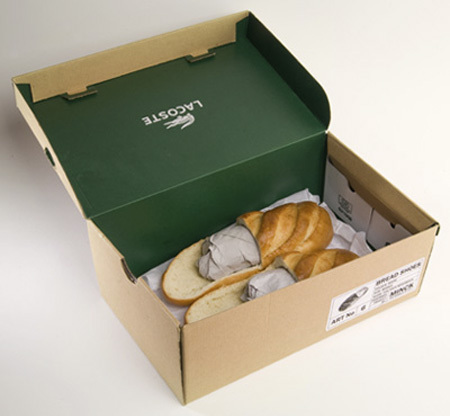 Well, it’s a cool idea for one-time shoes, like in hotels :) These can be in 7-star hotel :D What about the quality? I don’t think those are practical. But they are cool. You can tell your friends that you have no money, so on your birthday you had a shou filled with a bacon and cheese. Food in your feet? 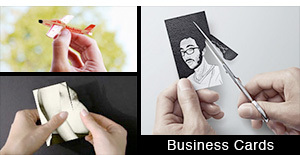 Gross… Creative? Come on people, it´s stupid. 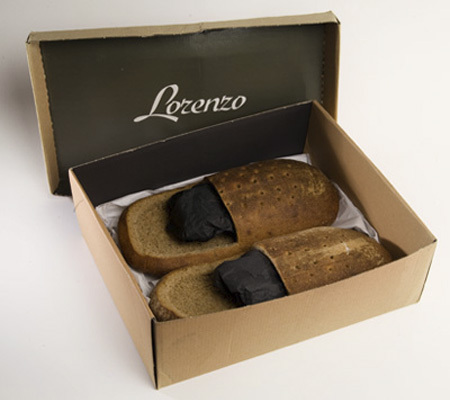 if i eat this bread, i imagine smell the shoes sting. not agood idea. It´s a great Idea, but taken from H.R. 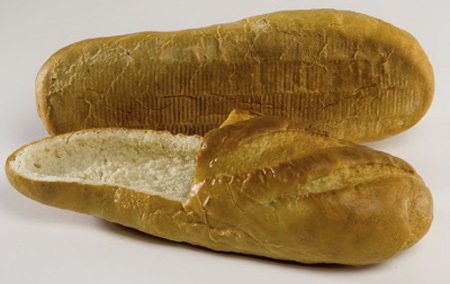 Gigers breadshoes back in the 80s. But it`s cool, no doubt. 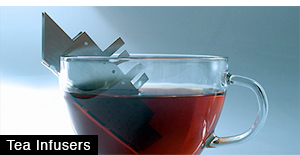 I like the idea, but there’s no way they’ll fit in my toaster.And where do i put the jam? Forget the feet throw some turkey, tomaTOE, and lettuce and call it lunch! Is this suppose to be some sort of artistic statement? Hmmmm…so do you wear them or eat them?! 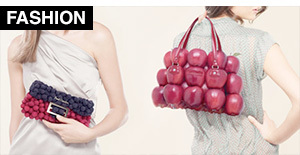 Because you surely can’t wear them THEN eat them!! are these actually like sold?! omg thats so funny!!! 22 pounds for a little bread ! I want to see some feet in those shoes! Yeah…consensus = this is just not smart or all that clever…and a pretty gross concept. 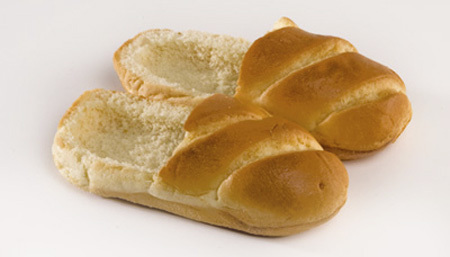 Okay so maybe its just me but its the same shoe type every time, it just the bread loaf thats different. I would be far more impressed if they had a sandal or a thong/flip-flop or a high heel. The ‘loafer’ while a fun play on words is just boring. they will go great with my hat of meat! Hey, We sure it hasn’t any bad smell? haaha!!! 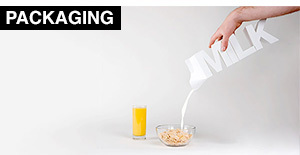 Fantastic, I have always wondered what to do with toe cheese. Wear once and eat. That’s perfect because I know some people whose feet smell like cheese! 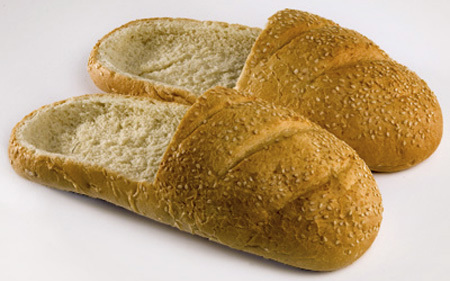 Hey I was wondering where I could purchase some of these bread loafers at. Please contact me back with information.